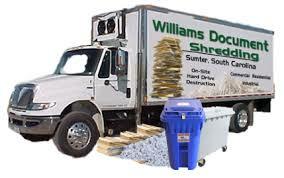 Williams Document Shredding Merges with Shred360! Sumter-based document shredding firm Williams Document Shredding announced Friday, May 5th, that it has merged with Shred360 of Columbia. The companies will unite under the Shred360 banner, creating the largest locally owned information destruction company in South Carolina, according to Mr. Williams, managing partner of Williams Document Shredding. 8756 Hwy 17 Bypass S.